End Water Poverty (EWP) is an international campaign with 185 partners in 55 countries to end the global injustice causing millions to live without access to clean water and sanitation. The members call for policy changes that must be delivered by donors as well as both national and local governments. Their initiatives are strongly connected to the G8 process. EWP aims to encourage the G8 – as one of the most influential donor forums – to constitute a global action plan for sanitation and water monitored by one global task force. EWP is supporting the German WASH Network since it’s founding through connecting it with international partners. The Forum Umwelt und Entwicklung (Forum for environment and development, FUE) is a mechanism for coordination and coherence among German NGOs which work in the field of environmental conservation and development cooperation. Since 2008, FUE is accompanying the networking of German NGOs from the WASH sector and has vitally contributed to the founding of the WASH Network by targeted support of joint activities. The environmental non-profit GREEN LEAGUE originated in the East German democracy movement and was founded as a network of environmental movements with a wide array of topics. The Water Policy Office in Berlin represents the GREEN LEAGUE in water policy questions and coordinates policy briefs and position papers such as the policy paper on sustainable sanitation (2009) issued by the German NGO Forum on Environment and Development. GREEN LEAGUE was one of the main supporters of the Berlin referendum on water privatization (2011) and of the first successful European Citizens’ Initiative on the human right to water and sanitation (2013). The Water Policy Office supports activities of the WASH-Network and promotes the idea of sustainable (i.e. in particular ecologically sound) sanitation in political processes. The Institute for Hygiene and Public Health (IHPH) of the University of Bonn is working in the thematic area of drinking water and wastewater hygiene for more than a hundred years. The IHPH is an accredited drinking water research lab and famous for its longstanding research in the field of WASH and Medical Geography/Public Health. Since 2001 the IHPH is designated as a WHO Collaborating Centre for Health Promoting Water Management and Risk Communication. A core area of this cooperation is the implementation of the Protocol of Water and Health which aims to improve access to safe drinking water and adequate sanitation worldwide. SuSanA (Sustainable Sanitation Alliance) is an international network of more than 300 organisations and 8,000 members who share a common vision on sustainable sanitation and are dedicated to the achievement of the Sustainable Development Goals. Thirteen thematic working groups have been established in order to cover a variety of different sanitation aspects and to provide outputs that underline the problems and opportunities of these aspects. An open library, an open discussion forum, network meetings and webinars provide international exchange and cooperation opportunities. Since SuSanA’s foundation in 2007 the GIZ program Sustainable Sanitation is responsible for carrying out the secretariat function. Several Members of the German WASH Network are founding members of SuSanA, are participating actively in working groups or leading them. An intensive and constant exchange between the networks has been established. The E-paper of the WASH Network can be found in different languages in the open library of the SuSanA. THW (Federal Agency for Technical Relief) is a civil protection organization funded by the German Federal Government. The commitment of approximately 80,000 volunteers across Germany, half of which are operational staff, is the basis for the work of THW in civil protection. With its technical expertise and diverse experience THW supports firefighters, police, charities and other organisations. THW is also deployed worldwide on behalf of the Federal Government. Its tasks include technical and logistical assistance within the framework of the Community Civil Protection Mechanism and on behalf of UN agencies. Since its foundation in 1950, THW has been deployed in missions in more than a hundred countries. As humanitarian ambassador of the Federal Republic of Germany, THW complies with the joint global responsibility of helping people in need. With its Rapid-Deployment Units for Search & Rescue (SEEBA) and Water & Sanitation (and SEEWA), THW provides emergency relief everywhere in the world, where it is needed. Furthermore, it is active in providing advice and support for the coordination of relief measures. Since the foundation of the WASH Network there has been a constant exchange between its members and the THW and a close cooperation in the area of WASH capacity building. The umbrella organisation of German development and humanitarian non-governmental organisations (VENRO) is a voluntary coalition of about 120 German NGOs which are working nationwide. Its aim is to promote dialogue and the exchange of experience among these NGOs and to represent them in public and in dealing with governmental agencies and other international organisations. While VENRO supported the founding and consolidation of the German WASH Network in 2011 the WASH Network helped to give more weight to the subject area Water, Sanitation and Hygiene (WASH) in German development cooperation within VENRO. 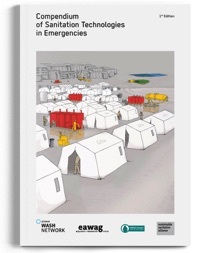 In 2012 the WASH Network and VENRO developed and published a joint position paper for WASH. The Global WASH Cluster (GWC) is a platform for the key actors engaged in humanitarian WASH aiming to improve the coordination in the WASH Sector. Its role and responsibilities are designated by the Inter-Agency Standing Committee (IASC). As a full member of the GWC the German WASH Network is also represented in the Technical Working Group “Markets” as well as in the Strategic Advisory Group of the GWC (via the member organisation Welthungerhilfe). The German WASH Network (GWN) will host the GWC Annual Meeting 2018 in Berlin.